This is not a review, this is a recommendation. I was sent this book to review for my LGBTQ YA Month next July, but having finished it, I can't wait until then to talk about it. Don't Let Me Go is absolutely amazing. 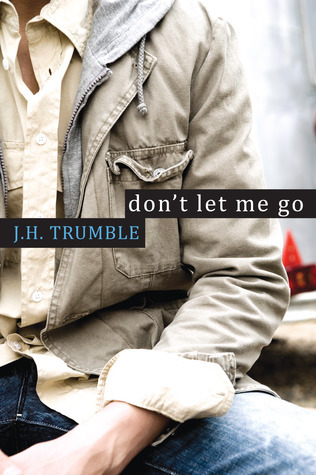 Brutally honest, in this novel, Trumble shows the harsh reality gay people can face. It covers all issues or problems imaginable; coming out, fighting for gay rights, and horrific homophobic attacks. We all know homophobia exists, but Don't Let Me Go is a real eye-opener, showing us exactly what people can go through. It made my blood run cold, it broke my heart, it made me feel physically sick, and more angry than you can possibly imagine. Yet, it's also a love story, and one of the most beautiful I have ever read. This is a story that shows epic love can exist without the supernatural or paranormal. It's big, it's powerful, it's passionate, and it's just so amazing. I don't want to say too much more, I'll save all the details for my review. I just had to tell you about this fantastic book. One of my top 3 favourite books I've ever read. I implore you to read it, it's absolutely incredible. I third your recommendation, emphatically. It's a wonderful, wonderful book, and I really REALLY wish I could just... well, force everyone to read it now now now. OHH! Thanks for letting me know, I shall have to look it up! And yes, I want to make everyone read it too! It's so amazing! Thanks for the rec, Sarah!